Soooo this baby is still cooking. I feel pretty good just huge, and uncomfortable but I am enjoying my last few weeks with one child, before I never get sleep again! I have been sleeping pretty great actually and only wake up about once or twice a night to go to the bathroom or roll over...my heartburn is still awful and my back and hips are SO SORE. I had a doctors appointment today and I am 80% effaced, Blood pressure is normal, baby is measuring 37 weeks, and she is about 6 lbs 1 oz. 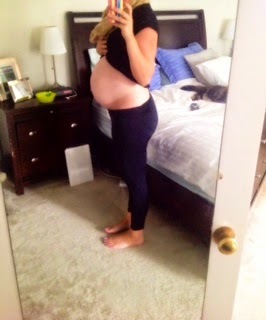 She is healthy, I am healthy, we are just counting down the days until she decides to make her grand entrance.